Friendship Commanders: NEW JUNEBUG EP AVAILABLE FOR PRE-ORDER TODAY! 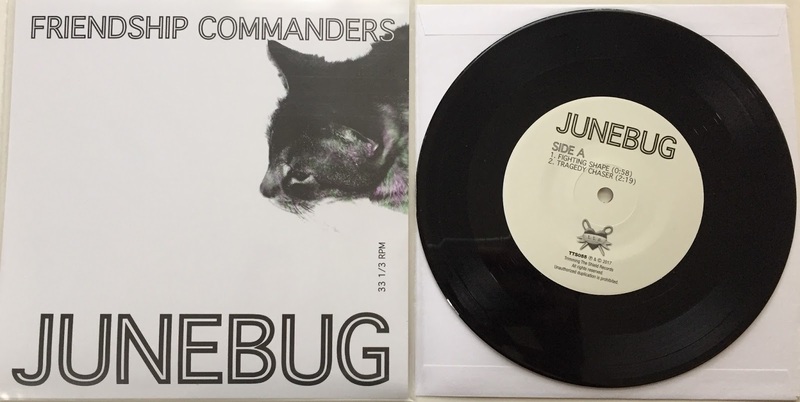 NEW JUNEBUG EP AVAILABLE FOR PRE-ORDER TODAY! We're excited to announce that our new EP, JUNEBUG, can now be pre-ordered! It will be released on April 15th, and will only be available on 7" vinyl with digital download. You'll be able to get it at Grimey's in Nashville, at our live shows, and online. Pre-ordered records will ship on April 18th. One song from the EP will be yours as soon as you pre-order your copy. We hope you enjoy it! This record is meaningful to us because each song was inspired by or contributed to by people outside of our band. "Fighting Shape" was inspired by our comrades in BELLS≥ and is dedicated to them. "Tragedy Chaser" was co-written by Jesse Michaels (Operation Ivy, Classics of Love). "Berlin" features a German translation by N. A. Huebsch Jr., and "Swan Dive" was written by Jay Joyce and originally performed by his band, Iodine. In the spirit of community and collaboration, one dollar of every copy sold will be given to the ACLU. Some incomplete tour dates are listed below. Our show in Nashville on March 24th will be the last local one for a while. We look forward to playing with friends in town and then touring throughout the rest of the year. Finally, B. is curating and releasing a compilation called Resolution of Happiness this year. The call for original music submissions is open now and will close on April 23rd. If you'd like to know more about the project, read about it here. All proceeds will go to Lambda Legal.